Click on A Special message of love to see a unique way of sharing the love of God. Try creating your own Voki character, find a message of love to share today, and send it to someone who needs to hear about how much God loves them! 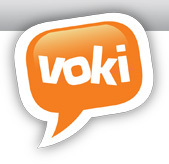 Just click on Voki to begin.